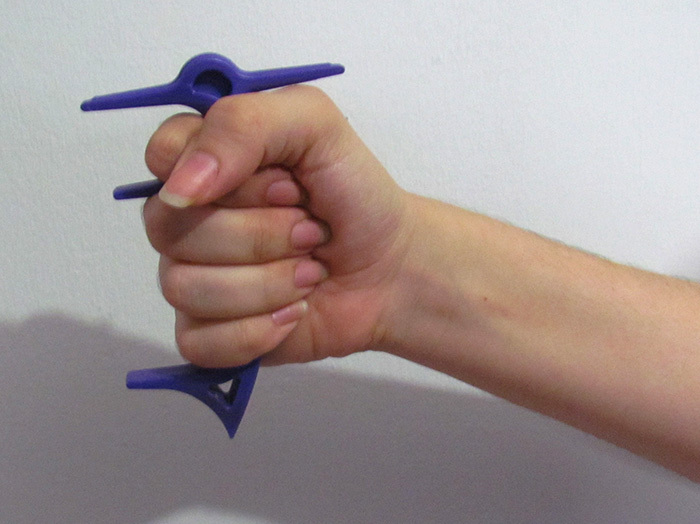 The SPIKEY™ is a self defense tool that can be used quickly andefficiently by anyone. The SPIKEY™ technique is a self-defense technique and “real life” proven methods to on how to perceive dangerous situations and how to react effectively under stress. No prior martial arts experience or fitness level is required. It is a ‘force-multiplier’ which allows the user to deliver controlling power without the need of extensive martial art training or overwhelming strength. Designed as a key chain and in multiple colors, it is both a fashion accessory and powerful self-defense tool. The SPIKEY™ will make any attacker holding you or grabbing you let you go! It can be used easily and quickly as a defense device against a personal assault, or subdue an assailant. The tool does not shock an aggressor like an electric gun. It will not cause permanent or temporary injury, such as bone fractures. Using SPIKEY™ in accordance with the instructions will cause an attacker holding you or grabbing you to release his grasp . . . guaranteed!